As I discussed in my Getting Smart article, Back-to-School Prep for School Leaders, we know from supporting schools and districts across the nation for the last 17 years that some of the greatest levers to improving student achievement lie in the school leader and an effective Instructional Leadership Team (ILT). Built around the concept of distributive leadership, an ILT is sometimes called a School Improvement Team (SIT), a School Leadership Team (SLT), or a School Management Team (SMT). But no matter what acronym you choose, the team is vital to the success of any school improvement initiative. The team is generally made up of administrators, mentor teachers, and teacher leaders who work collaboratively to execute on key goals. I’d like to walk you through three keys to building strong ILTs in your schools or districts. 1. Devise, launch, and execute improvement goals. Despite educators’ best efforts, the majority of initiatives in schools today fail. With some estimates showing failure as high as 70% strategic initiatives in for-profit companies, the challenge is even greater with school improvement efforts. While school improvement is certainly complicated, what’s the main reason for this failure? Execution. Unfortunately, good intentions are not good enough when it comes to driving and sustaining growth. The Monitor Deloitte, a management consulting company, has studied and participated in the strategic planning process for organizations from a wide variety of fields. Like in education, they were concerned with why so many strategic efforts seem to fail or falter before they even start. A key takeaway from their work is that you can't "freeze strategic thinking in a five-year plan." Rather, strategy has to be adaptive: It has to change as the circumstances and facts change. Therefore, strategic planning should move away from "classic" approaches to adaptive ones. Specifically, this means shifting away from making predictions, collecting data, and executing from the top down—and towards conducting experiments (such as small, 45-day projects), using pattern recognition, and execution by the whole. When ILTs create a school improvement plan, we recommend that the school's vision and beliefs are linked to a “big” two-year goal, which is then broken down down into smaller annual or bi-annual goals. The team then creates 45-day improvement projects that actualize the annual goals. The 45-day period is intentional because it forces urgency but leaves enough time to change course if the improvement project is not working. 2. Cultivate a mindset of focus, discipline, and accountability within every staff member and ensure that concrete actions are taken every day toward goals. The implementer’s mindset is an attitude that strong implementers hold about what it takes to be successful. A precursor to action, this attitude is not a strategy or tactic, but rather a heightened sense of awareness about implementation. Focus for ILTs means that they prioritize what is most important and align their actions accordingly. Discipline for great ILTs is about staying the course: They make adjustments, but only those that allow for balance and progress. Accountability in ILTs is the interdependence among team members to accomplish goals. Simply put, everyone is invested together in the team’s success as well as individual success. 3. Select ILT members carefully. As authors Gino Wickman and Mark Winters discuss in their book, Rocket Fuel, successful teams have a balance of visionaries and integrators. Both are equally valuable and necessary, especially with ILTs. Visionaries have an overall view of what the school needs to look and feel like when it is no longer in turnaround status and well beyond the initial years of stability. Integrators, on the other hand, are great at getting things done by tackling issues daily, keeping people disciplined and focused, and translating big ideas into action. In closing, strong teams use tools, interviews, and common sense to screen candidates and select leadership team members capable of driving rapid school improvement. Each ILT member should have the sensitivity, grit, and knowledge to lead the school to a greatly improved state. 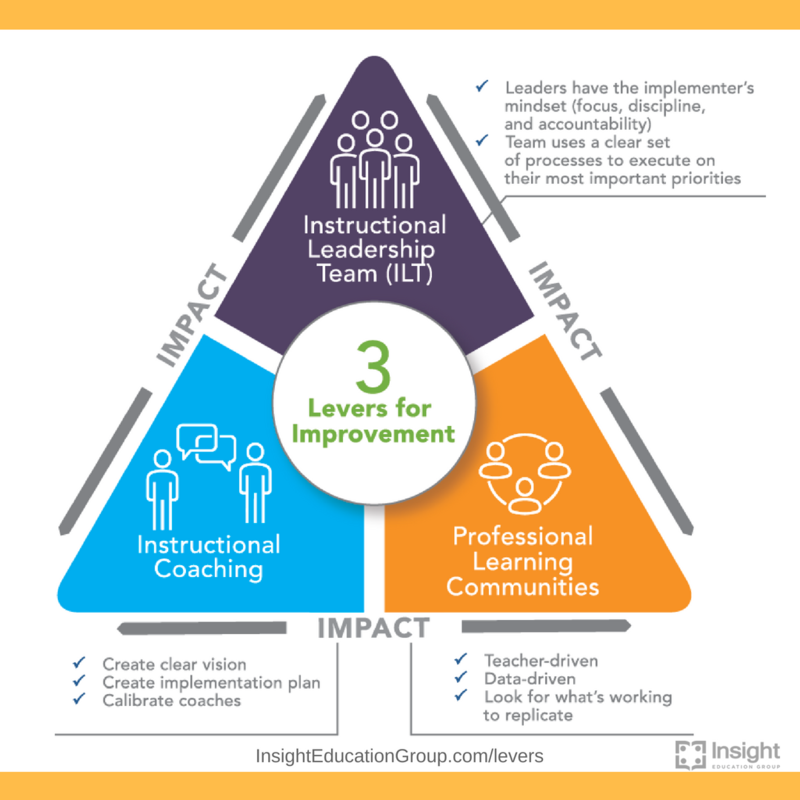 See how your ILT can be a key lever to impacting two other levers for educator growth.